Why are some items described here whereas the majority are listed only in the Index? As is explained in the introductory note on the Fakes Menu page, the lack of volunteer assistance with this project, meant it has had to be simplified. Where there is no available information other than that given in the bibliographical 'Reference' cited in the Index table, you will need to follow up that source online, or, if it is in printed form, on your own shelves or in a library. Those maps or artefacts given entries on this page are more complex (for example suspected fakes of manuscript maps), they have multiple references, they have not been written up in an accessible place, or they otherwise deserve more comment. Should a volunteer be tempted to offer their services, the Index table could form the basis for a general catalogue of cartographic deceptions. The Albarel entry gives an idea of how a complex entry might be treated. For the detailed analysis of what is the only forgery, so far identified, made up from elements of different originals, see the detailed analysis by John Woram. 'Carte des pays d'Amérique Septentrionale dressée en 1778 avec privilège du Roy'. 'D. Derveaux del. sculp'. [St Malo, 1960] or 1969. Image size: 347 x 430 mm [13.5 x 17 in]. The available online image is from an eBay offering (from 'kollectibles4sale', which ended, without a bid, on 5 October 2013). [Please notify me if you find a better online scan.] Clicking on the thumbnail brings up reasonably clear details. However, they do not reveal the discreet signature of its creator Daniel Derveaux, beneath the turtle in the vignette bottom left. Nor was this mentioned in the description. The date of creation is unclear. An estimated date of 1960 is given in the catalogue of the Bibliothèque nationale de France [no longer retrievable; no shelf-mark had been included] but the WorldCat note says [to find the three entries for this map, sort by title]: "1 edition published in 1969 in French and held by 3 libraries worldwide". Even if the modern signature had been missed, the evident absence of a plate-mark, the lack of a central fold, the careless draftsmanship and muddy printing appearance, not to mention the very modern appearance of the paper, are all sufficient to show that this is not an original production. Two of the examples traced in public collections describe it as a 'facsimile'. But that is incorrect. This is actually a further example of a 'concoction' - on which see the note under Fakes - in other words, a strange hybrid comprising re-drawn copying (from different sources) with fake additions. The easily missed signature, the use of the word 'sculp' (i.e. engraved) for something that is not an engraving, and the lack of a date that would have removed any doubt about its true nature, can lead to it being mistaken for an antique, even if that was not its creator's intention. The map's purpose seems to have been to offer a very early instance (albeit an imaginary one) of the cartographic recognition by the French of the 1777 Articles of Confederation (following the Declaration of Independence the previous year). It was the Articles that introduced the term 'United States of America'. A prominent 'Etats Unis' is inserted along the east coast and the false, and thoroughly misleading, date of 1778 inserted in the title. The earliest recorded map acknowledging the independence of the United States was issued by Rigobert Bonne in 1781. See [Ashley Baynton-Williams], 'Printed Maps of the United States 1778-1800', Map Forum, 1 . Apart from California being an (unconvincing) peninsula and 'Amerique septentrionale' written over just the western half of the continent, this has the feel of a simplified copy of a 17th-century map. The author displays his cartographic ignorance with a vertical north pointer alongside converging meridians, a feature also found on the '1631' doctored reproduction of the Hondius map of North America. The decorative elements are likely to have been added from various sources. The title cartouche is of the kind seen as early as 1608 (Blaeu's map of America) and found regularly throughout the 17th century. Philip Burden's The Mapping of North America: a List of Printed Maps 1511-1670 (Rickmansworth: Raleigh Publications, 1996) and Vol. 2 ... 1671-1700 (Rickmansworth: Raleigh Publications, 2007) provides numerous similar examples although not the identical one. That could mean that this had been copied from an early-18th-century map of North America or one featuring another part of the world. Likewise the group of three Indians with a European trader in the lower left uses outlines for the indigenous figures similar to those found on maps from the 1612 Champlain onwards. However, the trader appears to be in a costume of the mid-18th century and this vignette was probably copied as a whole. According to Google Books the map also appeared on page 165 of Michel Morin & Chris Perrot, Le Retour du lys (Saint-Laurent, Quebec: Editions du Trécarré; Paris: F. Lanore, 1985), a work concerned with historical prophecies, astrology, etc. and, in general, a repudiation of rationality. I am grateful to Kenny Baker for, once again, drawing my attention to a relevant counterfeit, as well as for the Baynton-Williams reference. Ed Dahl provided links to much of the information on Derveaux and provided many useful comments. For more details about Derveaux see under 'Concoctions'. The discovery of a first century B.C. scroll, containing a one-metre long, uncompleted map on papyrus, thought to represent an itinerary map depicting part of Spain, was first mentioned in the 1990s. Although the area depicted has not been identified, it is thought to show roads, rivers and settlements. It was exhibited in Turin at the Palazzo Bricherasio in 2006 (with the catalogue issued by Electa in Milan). The full official exposition has yet to appear. In a 534-page analysis Professor Canfora has claimed the map to be a fake, and specificially that it is the work of the noted mid-19th-century counterfeiter Constantine Simonides. This view is strongly contested by some writers. Federico Condello, '"Artemidoro" 2006-2011: L'ultima vita, in breve', Quaderni di storia 74 (2011): 161-256 [with extensive bibliography]. Didier Marcotte, 'Le papyrus d'Artémidore: le livre, le texte, le débat', Revue d'histoire des Textes, N.S. 5 (2010): 333-371. Irene Pajón Leyra, '"Ipsa hispaniae flvvivs". Bocaccio y el papiro de Artemidoro', Palaeohispanica 10 (2010): 591-600. Irene Pajón Leyra, 'Xiphías in the Artemidorus Papyrus', Zeitschrift für Papyrologie und Epigraphik CLXX (2009):64. Giambattista D’Alessio, 2009, 'On the "Artemidorus" papyrus', Zeitschrift für Papyrologie und Epigraphik 171 (2009): 27-43. There was a conference, 'Geografia e cartografia nel Papiro di Artemidoro', organised by the Società Geografica Italiana, in Rome, 27 November 2009. Richard Talbert, 'P. Artemid. : The Map', in: Brodersen Kai & Jas Elsner (eds) Images and Text in the "Artemidorus Papyrus": Working papers on P. Artemid [St John's College, Oxford, 13 June 2008]. Historia - Einzelschriften. Band 214 (Stuttgart: Steiner, 2009), pp. 57-64 (ills. pp.158-63). Gianfranco Adornato, 'Didascalie, disegni e zoologia sul Papiro di Artemidoro', Archiv für Papyrusforschung und verwandte Gebiete, 54:2 (2008): 223-45. Salvattore Setis, Artemidoro. Un papiro dal I secolo al XXI (Turin, 2008). Kai Brodersen & Jas Elsner. 'The Artemidorus Papyrus'. A one-day conference at St John's College, Oxford, on Friday, June 13th, 2008. Select Bibliography [scroll down to this for references before that date not noted below]. Peter Parsons, 'Forging ahead: Has Simonides struck again? ', Times Literary Supplement (22 February 2008), p.14. Luciano Canfora, Il papiro di Artemidoro (Rome/Bari: Editori Laterza, 2008). Franco Farinelli, Sulla "Tradizione Roaman dei Segni Cartografici", Quaderni di Storia 66 (2007), pp. 353-70. Claudio Gallazzi & Salvattore Setis, Le tre vite del Papiro di Artemidoro. Voci e sguardi dall’Egitto greco-romano (Milan: Electa, 2006). Claudio Gallazzi & Barbel Kramer. 'Artemidor im Zeichensaal. Eine Papyrusrolle mit Text, Landkarte und Skizzenbüchern aus späthellenistischer Zeit', Archiv für Papyrusforschung und verwandte Gebiete, 44, 2 (1998, i.e. April 1999): 189-208. There is considerable scope for bibliographical confusion with this map and the context needs to be described before it can be properly understood. Philip Burden describes three versions of the Petrus Bertius Carte de l’Amerique, i.e., printed from three distinct copperplates. The subject of this note, known from an example at Yale University, in the Sterling Memorial Library, SMLMAPL 70 1624, bears the date 1624. So, confusingly, does the genuine first state of one of the other plates, described by R.V. Tooley (1973) but which Burden (1996) could not locate. The distinction between the three original plates can be broadly summarised as follows. The Fleming, Petrus Bertius, living in Paris as Cosmographer to Louis XIII, produced a close copy of the Jodocus Hondius map of America, published in Amsterdam in 1618 (Burden No. 192), but omitted the decorative borders. Where the source map had been in Latin, the three derivatives are in French. The earliest is Burden No. 209. Its first state was indeed dated 1624. Since no example of that was available, Burden was forced to illustrate and describe a second state, dated 1640, assigned to the publisher Michel van Lochom. A scan of the 1640 version can be seen courtesy of Barry Ruderman. Interestingly, the van Locom publication incorporates a major change along America’s North-West coast. The outline and toponymy were removed and replaced with a feint coastline labelled ‘PAYS NON ENCORE DESCOVVERTS’ (land not yet discovered). This was not the work of Bertius, who had died in 1629. The second plate, which directly concerns us here, has a similar title, is undated, but can be assigned to a set of the continents produced by Melchior Tavernier in 1627 (Burden No. 218). The America sheet faithfully reproduces the Hondius coastline and toponymy, which are assumed to be present on the genuine (lost) 1624 version. A scan of the later printing [1627?] can be seen courtesy of Harlan J. Berk. The map in Yale’s Sterling Library can be seen in their enlargeable scan . It is a photo-litho reproduction, with – as apparently the sole addition – the date 1624 placed in the vacant space beneath ‘faictes par P. Bertius’. The digits are strangely formed, quite unlike the numerals elsewhere on the map. Adding a date to a fake is standard practice as it provided supposed authenticity, yet this can also help to unmask them since most originals are undated. Although there was a later state, datable to 1640 by analogy with the three other continents, the original version of this map was never dated. A third version of the Bertius ‘America’ (Burden No. 256) appeared with the date 1639, apparently published, once again, by Tavernier. In addition, the genuine 1624 imprint (reported by Tooley) reads: "Faictes par P. Bertius L'anneé 1624", whereas the Yale imitation has no more than "faictes par P. Bertius 1624”. That the Yale map is an imitation – strictly a faked facsimile – was confirmed by a close examination by the curator Margit Kaye. There is no platemark; the paper does not appear to be old and has no chain lines (although the linen backing makes examination difficult); there is no watermark; and the general browning might have been intended to indicate age. The expected central fold is not present. That the colouring is not old is inconclusive since colour was routinely applied to untinted maps in the 20th century. That it is an imitation had in fact been noted in 1957 by Carl Wheat, who termed it a ‘photostat’. Two questions remain: what is the latest date the Yale map could have been produced and what might the faker’s motive have been? On the first point we are helped by the presence of a stamp on the verso, reading ‘Karpinski-von Wieser Map Collection’. Both those named were noted historians of cartography: Louis Charles Karpinski (1878-1956) and Franz Ritter von Wieser (1842-1923). It is not known if the map had been in Wieser’s possession but the composite collection came to Yale in 1935 (with this map evidently among them), thus providing the latest likely date for its creation. The fake date 1624 was not added in ink but must have been written by hand onto an intermediate copy as an integral part of the reproductive process. It is unlikely that either man would have realised the date was an addition though they might have been confused into thinking that this was an example of the genuine 1624 version. Who might have been responsible? Daniel Derveaux was a well-respected French artist and illustrator, working in St Malo from at least 1933. He was then using engraving and, by 1942, lithography, as well as offset printing (probably the technique used in this case). However, his continuing family business is clear that this was not one of his productions. See the general note on cartographic concoctions and specifically those produced by Derveaux. It is also the case that he, like most of those who added spurious elements to their copies, knew little about the history of cartography, so that the resulting anachronisms can be easily recognised. By contrast, whoever was responsible for the Wieser-Karpinski map - in a period (pre-1935) when few carto-bibliographical aids were available - knew about (or luckily guessed?) the existence of the now unlocated genuine original of that same date. An interesting puzzle. Philip D. Burden, The Mapping of North America: a List of Printed Maps, 1511-1670 (Rickmansworth: Raleigh Publications, 1996), No. 218, Plate 218. Carl I. Wheat, Mapping the Transmississippi West, 1540-1861, 5 vols in 6 (San Francisco: Institute for Historical Cartography /Grabhorn Press, 1957-63), Vol. I, p. & no. 37. A misleading version of the Blaeu map of America appeared on eBay in January 2011 < http://cgi.ebay.com/1642-Willem-Janszoon-Blaeu-Americae-Nova-Tabula-Old-Map-/110631852394 > . It is on very clean, crisp, obviously modern paper (despite the imitation chain-lines and the watermarks designed to give the impression of hand-made paper). There is no text on the verso and no central fold. It has the very wide fake platemark so often found on such fabrications. It is not possible to see this from the eBay photograph but the original, very narrow platemark may be visible. What distinguishes this from a straightforward facsimile (albeit one designed to deceive) is the fictitious date, 1642, added in a modern typeface to what is clearly a photo-lithographed production. This joins a growing number of imitations whose date, ironically added so as to give spurious authenticity, actually betrays it. It may however be the first instance where the date was the only false addition. The genuine map, which never carried a date, appeared first in 1617. The model for this version is either the fourth state of 1642 or possibly the final one that appeared in or after 1645 [no scan of that is to hand] and that continued to be published up to the time of the 1672 fire. The distinguishing feature of the genuine 1642 state concerns the ship placed in the middle of the inscription Mare Pacificum. The sea surrounding the ship has been extended to the left to fill the grid square beneath the 'P' of Pacificum. The source for this fake/facsimile may perhaps have been an atlas dated 1642. I am grateful to Daniel Strebe for drawing this to my attention. His attempt to discover from the vendor where he had obtained the map produced no response. It received no bids at $50, which is an encouraging sign. Philip D. Burden, The Mapping of North America: a List of Printed Maps 1511-1670 (Rickmansworth: Raleigh Publications, 1996), No. 189, Plate 189 (illustrating the 1617 state - signed 'Guiljel. Janssonio', which was changed to 'Guiljelmo. Blaeuw' [as here] in 1621). "Of the 1650 Blaeu stand-alone etching of Nieuw Amsterdam, on exclusive contemporary Blaeu paper, usually called by dealers "the Visscher view" because it was incorporated, together with the 1650 Jansson map of Nieuw Netherland, in the 1651 composite emendata map by Visscher, later copies exist on "old" paper (not Blaeu paper). The paper is generic and there is a deep impression of a purported plate mark. The authentic Blaeu views were "cuttings" so no deep plate marks exist. The "forgeries" are not as detailed as the originals because, in the photographic copying process and etching, the definition of the lines suffered so that in the darker shadow portions the ink clotted. Because of the immense interest about the New Netherland period in the early twentieth-century and the already wide use of photography, the forgeries could be from that time." Daniel Strebe reported to MapHist on 18 July 2007 [with follow-up notes to the editor of this page] that he had acquired an example of Willem Jansz. Blaeu, 'Virginiae partis australis, et Floridae partis orientalis, interjacentiumq, regionum Nova Descriptio', with the inscription 'Auctore Guiljelmo Blaeuw. 1660'. The map, which probably first appeared in 1638, the year of Willem Blaeu's death, continued to be used after the Blaeu auction in 1677, appearing in atlases produced by Frederick de Wit and Christopher Browne (c. 1708). No original impression is recorded with either a signature or a date. The owner thinks, from the condition of the mount, that it must date from some decades ago. It is not possible to establish the status of this map conclusively without detailed photographic evidence. However, it appears that the map has a wide, false platemark. Philip D. Burden, The Mapping of North America: a List of Printed Maps 1511-1670 (Rickmansworth: Raleigh Publications, 1996), No. 253, Plate 253. "Apparently the original copper plate of the left half of the map still exists in Italy, though its location is not known (to me). Twentieth-century restrikes from this plate, printed on old paper, come onto the market at regular intervals, and some have been sold to collectors and institutions as originals." (Dahl p.42). The restrike will, inevitably, be of the final state. This has the addition of the engraver's name "Gio: fed.co Pesca f." (Giovanni Federico Pesca fecit - a reference to a 17th-century Neapolitan engraver) on the underside of the 'scroll' for the Huronum inset. A Native American canoe has also been added beneath the Mare of Mare Dulce [L. Huron]. As yet, no original impression of this later state of the left hand sheet has been identified. Originals of the complete two-sheet map are known in the Bibliothèque nationale de France, Paris, and the Österreichische Nationalbibliothek, Vienna. In 2002, Library and Archives Canada acquired the right half of this map, via the April 2002 auction of Reiss & Sohn (Lot 3676) [Burden II: p.xxxviii, No.323]. Philip D. Burden, The Mapping of North America II: a List of Printed Maps 1671-1700 (Rickmansworth: Raleigh Publications, 2007). Louis Cardinal, 'Record of an ideal: Father Francesco Giuseppe Bressani's 1657 map of New France', The Portolan 61 (Winter 2004-2005): 13-28. Edward H. Dahl, 'A second Bressani original of New France comes to light', The Map Collector 63 (1993): 42-3 [discussing a 20th century restrike of the left of two sheets of the 1657 map - but with added details], and 'Addendum' [i.e. correction] in The Map Collector 64 (1993): 51 [reproducing the two joined sheets of the original printing, in Vienna]. This is a skilfully redrawn version of Samuel de Champlain’s Carte geographique de la Nouvelle Franse … faict len [sic] 1612, produced in 1878. There is a coloured example of this version in the Osher Map Library and Smith Center for Cartographic Education, University of Southern Maine, Portland. They supply an accessible enlargeable scan. There is another more complete example in the Bibliothèque nationale de France (Département des Cartes et plans, GE C-9476). The imprint in the lower left margin informs us that this is a ‘Reproduction A. Piliński et Fils. Pour la Librairie Maisoneuve & Cie Quai Voltaire 25 à Paris’. The BnF catalogue entry suggests a date around 1880. However, this can be confirmed as 1878 from a reference in Julien Girard de Rialle’s Revue de linguistique et de philologie comparée, vol. XI (Paris, 1878), p. 99, via a Google Books snippet. The publisher’s imprint was on the part of the unusually wide lower margin. This has been cut off by hand at some point from the Osher Map Library example – a warning to any legitimate facsimile publisher in the future who does not want their production to be mistaken for an original. For a high-resolution image of the original engraving see the example in the Norman B. Leventhal Map Center, Boston Public Library. The original measures 44 x 76.5 cm; the 1878 copy is described as 43 x 77.6 cm (and 46 x 78 cm by the BnF), thus both versions are effectively the same size. The original map was printed from two copperplates, on separate sheets which were then joined. That arrangement was repeated for the facsimile. The handwriting and all other details were carefully and closely imitated. However, there are slight differences. In the legend top left, for example, the second word is ‘faictte’ on the original and ‘faictle’ on the facsimile (perhaps the work of a non-French-speaker?). Likewise ‘dicttes’ in the final line is mis-transcribed as ‘diclles’. 'C.Broton' for 'C. Breton' was also noted. The copyist made no attempt to reproduce the accidental marks, incidental to any engraving: for example, scratches and burin over-runs. This was intended as a facsimile, not a forgery. One, initially surprising, feature was the strange duplication of many of the compass lines that emanate from the right-hand compass rose, with some ‘ghost’ lines running parallel beside the real ones for part or even all their length. However, this can be seen very clearly on the Leventhal Map Center example, though only faintly on the BnF’s original [since it does not appear in a Gallica search, this was located from a Wikimedia scan (BnF class-mark not provided)]. Those mistakes, along with the heavy guidelines bounding the title lettering of the right half, would have disappeared naturally with the early impressions of the original engraving, or have been intentionally smoothed over. Thus the example used for the copying must have been a very early impression, and not the original identified at the BnF. This reproduction can also be recognised from the poor quality of the machine-made paper. The lack of the narrow plate mark that would be expected also confirms that it is not an engraving. Instead, the image was presumably drawn directly onto the lithographic stone, and then printed from that. It seems that not many copies of the Piliński version were issued, since (as we are told by Girard de Rialle) this was produced in ‘quelques exemplaires seulement’ and, to reinforce that claim, that the image was erased afterwards to make future printing impossible (‘la planche a été effacée après le tirage’). Adam Piliński (1810-87) was a notable and prolific creator of hand-drawn facsimiles from at least the 1850s to the end of his life. By then, photography would have been making that style of reproduction redundant. He also produced a copy of Champlain’s 1632 Carte de la nouuelle france (Burden No. 237). His oeuvre was the subject of a monograph, Adam Piliński et ses travaux: gravures, dessins, lithographies. Gravures Dessins Lithographies et Reproductions en Fac-similé par un Bibliophile (Paris, 1890). This concentrates on subjects relating to the Auvergne and Poland; a quick survey found no mention of maps. The Osher Map Library example was subsequently hand-coloured. This was not the case with the original, which was produced so that it could be included, uncoloured, and folded many times, in Champlain’s 1613 publication, Les voyages du Sieur de Champlain. There was only one state of the map, i.e., the content of all originals will be essentially identical. The Osher Map Library copy came to the University of Southern Maine in 1986, along with the Lawrence M. C. Smith Collection. However, as the online version on the Osher site does not indicate that this is a facsimile (a fact of which the 1988 catalogue entry shows they are well aware), others may have been innocently misled. [The website entry is due to be amended at the end of January 2017.] Any illustration of their example can be easily recognised by the clumsy repair patches in each of the lower corners. The unanswered question, though, is how many other examples may exist and if any – with their lower margins trimmed off – might be mistaken for originals? Specifically, given Piliński’s stated ‘talent for completing incomplete books’ (p. 5 in the 1890 publication cited above), could any of the surviving examples of the 1613 publication - or indeed other maps he might have produced - contain his reproduction instead of the original? There are two issues: the supposed connection with Zheng He, which was seen as tying in with Gavin Menzies's theories about a 1421 discovery of America; and the question of whether the map (supposedly subjected to radiocarbon-dating testing) was a (misinterpreted?) eighteenth-century original or a modern fake. On 14 October 2008, the London-based Guardian newspaper included a thumbnail illustration of a map as part of its 'Black History Timeline Part 2'. Wrongly captioned, this was traced back to the Bridgeman Art Library [search for XJL 181925], where it was listed as from a 'Private collection'. No other references to it have yet been traced, but information from the Bridgeman suggests the collection it belongs to was created in the 1960s, 70s and 80s. The map on which it is based, 'Occidentalis Americae partis', appeared in Theodore De Bry's Americae Pars Quarta (1594) and is described in Burden (No.83). It covers the Caribbean, extending into the lower United States and the northern part of South America. The map is another fake 'concoction'. Like the Albarel map of North America it is a hand-drawn copy of an original map, with additional illustrative details, which was then reproduced via lithography. The quality is so poor that it would not be listed here were it not for the fact that its presence on the image database of an international picture library makes it possible that it will appear, misleadingly, as a book illustration. Seen in high resolution it is clearly a fake; reproduced in a book it might be less obvious. The only available picture is here [search for XJL 181925]. Since that is no more than a thumbnail, a few details are given here. The map has no platemark (even a fake one) and the colour is printed. The title repeats the original wording, within a different cartouche, with mistakes in the Latin: Vel becomes Vol, Qui totis is run together, eas becomes cas, conflata becomes Constata, and the date MDXCIII (1594) becomes MDXIIII (1514). Decorative elements have been added or moved around, e.g. portraits of 'Reyna Ysabel' and Columbus upper left and Indian figures in the two lower corners. The large vignette of a goddess (?) sitting on a leashed sea monster is copied from the Hondius-Le Clerc map of America (1602? ), illustrated by Burden Pl. 145. The map has been extended on three sides - at the west to include the full coastline of the Gulf of Mexico; at the east by about 5 degrees; and to the south, leaving the graduated Equator (which had marked the map's lower edge) as the division between the original and the fake detail, to which an anachronistic outline of the Amazon has been added. Burden, Philip D., The Mapping of North America: A List of Printed Maps, 1511-1670 (Rickmansworth: Raleigh Publications, 1996), No. & Pl. 83. Doubts have been cast as to whether a number of early globes are in fact later printings, facsimiles, or modern forgeries, created by making up globes from the facsimiles of gores published by the Munich bookseller, Ludwig Rosenthal in the 1880s. The names of Johann Schöner and Georg Hartmann have been mentioned, and one version relates to the globe depicted by Hans Holbein in his painting, 'The Ambassadors'. A. D. Baynes-Cope, 'The Investigation of a Group of Globes', Imago Mundi 33 (1981): 9-20. Rodney W. Shirley, The Mapping of the World: Early Printed World, Maps, 1472-1700 (Holland Press, 1983, and subsequent editions, some with Corrections and Additions) No. 62, Plate 57. David Allen, in a message to MapHist on 23 August 2006, cites a passage from: Joseph A. Borome, 'An Interview between Justin Winsor and Henry Harrisse', The Hispanic American Historical Review, 32, No. 3 (Aug., 1952), 378. On globes see also other entries under 'Globe' in the Area column of the Index. 'In a much publicized recent case, an individual consigned a facsimile globe to Christie's, in London, and it was sold at auction as an original'. Francis J. Manasek, 'Facsimiles, Forgeries, and Other Copies', in Collecting Old Maps (Norwich Vt.: Terra Nova Press, 1998):73 (without providing further detail). There are two counterfeit versions of the Henricus Hondius map, which had originally appeared in the 1636 Mercator-Hondius Atlas (Burden 245). Burden reproduces the first state of the original (undated and without an imprint). The second state, issued in the 1641 edition of the atlas, added the imprint AMSTELODAMI, Excudit Ioannes Ianssonius. A scan of that can be seen on the Library of Congress American Memory site. Finally, there was a third state, produced by Valk & Schenk about 1694. The original map was never dated. '1629'. 'In 2003 Jim Lorson brought to the author's attention a facsimile edition. Its origin is unknown but can be most easily identified by the presence in the cartouche lower left of AMSTELODAMI,/ Sumptibus et typis aenis/ Henrici Hondii./ Anno Domini 1629, and a large compass rose in the Atlantic' (Burden II: xxvii, No.245). In September 2009 Edward Dahl kindly forwarded a scan of this version, identifying the points of difference. This is not just a photographic copy of a genuine map, to which an imprint and date had been added. Rather it is another of the growing number of 'concoctions', identifiable by the additional decorative elements that were introduced at the same time. Besides the false imprint, the most obvious alterations and additions here are elements set into the sea. Ed Dahl identified more than ten additions, of ships, sea creatures and the large compass rose in the Atlantic. These were presumably taken from other early maps but are, as usual, much enlarged, so as to unbalance the original composition. [On this see the note, added June 2010, about the South American pair to this map.] Since such counterfeits are created photographically they reproduce the outlines and place-names of the original, which make their pretend dates anachronistic. In this case, Burden noted elements on the 1636 original that had first appeared on maps in the period 1631-3. Interestingly, although the 1636 map was originally unsigned, Burden does attribute it to Henricus Hondius, in the first volume of his bibliography published in 1996 (i.e. seven years before the '1629' fake was reported). Although most fakers are not cartobibliographically aware might this be an exception? Was the faker trying to supply what might have been thought a plausible missing first state? In talking of the original, Manasek notes (p.79) that the form with the empty cartouche bears 'slight traces of a previous inscription that was burnished out'. [I do not have a good enough reproduction to confirm that for myself.] Might there really have been an earlier, genuine, Hondius state? [Update note, 29 September 2017.] I have been informed by the daughter of Donald MacGregor McElroy, that, when he was a U.S. Captain at a military field hospital near Versailles in 1945, her father had acquired examples of both the ‘1629’ and ‘1631’ imitations described here. Given that our earliest known reference to the ‘1629’ version comes from 2003, this would push the date back by a startling sixty years. Unfortunately, it has not so far been possible to provide firm documentation for that provenance. If that does prove correct, it is interesting – and most surprising - that two false examples of essentially the same map (yet produced by different methods) should have been found together. '1631'. 'There exists a reproduction of this map that itself appears to originate from the late seventeenth or early eighteenth century. It bears the curious imprint lower left Amstelodami / Excusum apud Iudocum et Henricum Hondium. Anno 1631. As Jodocus Hondius Jr. had died in 1629 this is an obvious error. The quality of the engraving is of a poor standard. On closer examination it appears to be of Italian origin' (Burden 245). This version is reproduced and discussed by F.J. Manasek (pp. 77-81), who gives high resolution, comparative details of one section to demonstrate that it is printed from a different plate to that used for the original. He concludes, like Burden, that it is a genuine copper-engraving, copied, with decorative alterations, from the original. He was aware of four examples, dating back as far as the 1930s. There is an example in the New York Public Library's Lawrence H. Slaughter collection. The impression Manasek had examined was on laid paper (i.e. apparently before 1800) and well coloured, in what seemed to be neither 17th century nor modern tinting. He concludes that he did not think it was intended to deceive. However if this was one of the late 17th-century Italian copies of Dutch maps (like those made of Blaeu's wall maps) the invented imprint must have been intended to disguise the Italian origin and give authenticity. It should perhaps be considered, if a bit ponderously, as a falsified, near-contemporary engraved copy. While both 1629 and 1631 versions include different ships and sea creatures (from the original and from each other), those on the 1631 engraving are similar in size to the original, in contrast to the grotesquely exaggerated forms on the 1629 modern fabrication. The most obvious visual feature, which distinguishes the counterfeits from the original and equally from each other, is the enlarged compass rose in the Atlantic (level with Florida in the '1629' version and level with Virginia in the '1631'). It is this, for example, that enables the counterfeits to be easily picked out from a page of online thumbnails, such as Google Images. [Update note:] In February 2010 Kenneth Baker reported that he had acquired examples of both the 1629 and 1631 versions via eBay (about two and four years ago respectively). '1629'. He notes that his example is on convincing laid paper (without a watermark) and with the more heavily inked sections raised to the touch, as you would find with an original. It has been carefully hand coloured. The counterfeit is slightly smaller than the original. It seems that this 1629 version may have been etched into a copperplate and printed in the usual way. [An impression from a photographically produced reproduction plate will be slightly smaller than the original model because the paper, damped for printing, shrinks once it dries.] Kenneth Baker also comments that, in introducing the large compass rose, the faker showed his cartographic ignorance by imposing a due North pointer on a map with converging lines of longitude. Burden, Philip D., The Mapping of North America: A List of Printed Maps, 1511-1670 (Rickmansworth: Raleigh Publications, 1996) No.245 and the 'Corrigenda and Addenda' at the front of Vol . II (2007), p.xxvii. Francis J. Manasek, 'Facsimiles, Forgeries, and Other Copies', in Collecting Old Maps (Norwich Vt.: Terra Nova Press, 1998): 77-81, 165. In May 2010, I was sent details by Kirby W. Brown, Paradise, California of a map of South America, issued as a pair with the Henricus Hondius map of North America and, like that, with the false date 1629. The title reads 'Americae pars Meridionalis. Amstelodami Sumptibus Henrici Hondy' [with, separately lower left] 'Anno Domini 1629'. Again, it is a 'concoction', a copy of a genuine map with added decorative elements. These involve an extra outer border, formed of alternating short rods and three small balls, matching that on the map of North America, and various illustrations, invariably over-sized, added in the sea. The inland areas seem to be 'unimproved'. The faker's most obvious contribution is the addition of two vast compass roses: a quarter one in the bottom left corner and a complete one, to the right, by the Tropic of Capricorn. These will allow this fake version to be speedily identified even from a thumbnail illustration. The lines that radiate from these unhelpful roses cause confusion with the curved meridians and parallels of the original, which they contradict. Once again, the faker demonstrates ignorance of, or disregard for, basic cartographic principles with these compass roses, which are apparently taken from the same source as those used for the North America map. Otherwise, ships and monsters, vastly out of scale and from an as yet unidentified source, have been stuck onto the master from which this photo-lithograph was created, sometimes in place of the modest original ones, sometimes incongruously alongside them. As a result a new sea monster, upper right, could have devoured the small retained ship nearby in a single mouthful. The original map has the large lettering for the Atlantic, OCEA / NUS AETHIO / PI / CUS. Because of a newly inserted ship, the fake leaves behind just the A of OCEANUS. The original map first appeared in Volume III of the Mercator-Hondius-Janssonius atlas in 1636 (not 1629). At that stage it had the imprint of Heny Hondius ('Henrici Hondy'). Then in 1647 his name was removed and that of Joannes Janssonius ('Ioannis Ianssony') put in its place. The original map was never dated. The best scan I could find of the original is of the Janssonius version on the University of Wisconsin's Digital Collections - search for 'Meridionalis' (the original is from the Clipstone Foundation). Kirby Brown (without whose generous help this note could not have been written) informed me that examples of the North and South America maps had been found, together, about two years ago. Most interesting is the fact that, on the reverse of each, there are various abbreviated notes, in Spanish, apparently comprising technical instructions to a printer, but also mentioning a figure of $4.096 c/u [i.e., each]. The equivalent map of North America was first noticed in 2003 but only now has its South America pair come to light. Burden, Philip D., The Mapping of North America: A List of Printed Maps, 1511-1670 (Rickmansworth: Raleigh Publications, 1996) and the 'Corrigenda and Addenda' at the front of Vol . II (2007). 'America noviter delineata Auct. Henrico Hondio. 1641. Amstelodami, Excudit Ioannes Ianssonius.' 'Edit P.V.'. This is the fourth state of the 1618 Jodocus Hondius Jr map, reissued by Henricus Hondius in 1631 (with the removal of its decorative features, containing town views top and bottom and costume figures along the sides), and here further reissued by Joannes Janssonius in 1641. The map appeared on eBay in April 2012, as pointed out to the (later discontinued) MapHist Forum by Daan Strebe on 7 April. As usual, the paper gives every appearance of being modern, there is no central fold, and a wide, even, rounded fake platemark has been added outside. Daan Strebe pointed out that process colour was not used, which means that there is no half-toning under magnification. 'Edit P.V.' presumably indicates the person responsible for the reproduction, probably the same as the 'Ediz. P.V.' who issued the copy of the 1570 Ortelius world map. The eBay seller includes the comment: 'It has an anchor watermark as well as the watermarked phrase "La Priglia, In Milano, Omalli (? )"', which makes it likely that this and the imitation Ortelius were produced in Italy. Burden, Philip D., The Mapping of North America: A List of Printed Maps, 1511-1670 (Rickmansworth: Raleigh Publications, 1996), No. & Pl.192. 'Nova Totius Terrarum Orbis Geographica Ac Hydpographica [sic] Tabula (Paris, 1640) [but here in State 3, 1649]. With the addition of a very small lettered imprint along the bottom: 'MARCEL MOLINIER 32 rue des Saints Pères PARIS'. See the eBay illustration of an example offered in 2014 by Kunsthandel Koskull. One of the scans shows clearly, from the reverse, the modern paper and fake platemark. On Marcel Molinier, who was aged 92 in April 2013, see Marcel Molinier, le confident et ami des artistes. This version of the map has an additional scalloped border, not shown in Shirley's illustration and evidently added by Molinier. Examples are hand-coloured and relatively common. Various watermarks have been recorded, among them 'Arches' and 'Van Gelder Zonen'. These copies should perhaps be classed as slightly enhanced facsimiles. NB. The Molinier imprint could easily be missed. At least one example of this has been seen on eBay, offered as an original. Rodney W. Shirley, The Mapping of the World: Early Printed World Maps, 1472-1700 (Holland Press, 1983, and subsequent editions, some with Corrections and Additions), No. 354, Plate 270. "The so-called Hungarian Vinland map came to light in Hungary in the [nineteen-]sixties, under hardly controllable and rather queer circumstances. The measurement of the manuscript is 20.5 x 28.5 cm. In all probability both its drawings and text elements derive from the same hand. The map is evidently a copy, a derivate [!] of the Stefansson or Skaholt or Vinland map (Royal Library, Kopenhagen, G.K.S.2880, 4o). In proportion to the Skaholt map it contains some new, remarkable elements: the Norman's sea-routes towards England and the New World, as well as some settlements on the territory of Greenland and North America. Because of these and the fact, that the map was published many times and on [!] a great number of languages, its analysis is necessary." Then follow sections/paragraphs on 'Projection', 'Geographical elements', 'The paper of the map', 'The ink of the map', 'The names in the map', 'Cartouche', 'Inscriptions on the edge of the map', and 'Summary'. [From the sci.tech-archive.net, in a post by Doug Weller on 18 April 2005 - the first section above is quoted from the report itself]. Erdélyi, F. István, 'Hungary's Vinland map', Acta ethnographica academiae scientiarum Hungaricae, 21 (1972): 347-52 [The Newberry Library note reads: "Describes a manuscript map in the National Széchényi Library in Budapest, probably made by Jesuits in the old Hungarian (now Czechoslovakian) town of Nagyszombat in 1599"]. Messages to MapHist, January-February 2005, from Kirsten Seaver, James Enterline and Jørgen D. Siemonsen, combined here. Zsolt Török to MapHist, 4 June 2007. Dee Longenbaugh (via MapHist) and Rodney Shirley (privately) report what sound like similar fake maps and charts being offered in the Grand Bazaar (Kapali Carsi or Covered Market) in Istanbul. These were openly on sale as copies, apparently in 1999. Shirley describes small sea charts for sale, beautifully executed by hand in Turkish script and some coloured with gold, in the style of Piri Re'is's 'Kitab-y-Bahiyre'. Some were on apparently old vellum and some on paper with earlier printed Ottoman text on the verso. Longenbaugh was told it was common practice to reuse old vellum, draw a map on it, and then coat it with egg white. Bruce Needham reported to MapHist on 11 August 2008 that he had "recently obtained what appears to be a print of the Janssonius, 1636, Nova Anglia Novum Belgivm et Virginia - but with some unique differences". A correspondence followed, under the heading 'Information on Print of Janssonius Map'. What turns out to be a physically unimpressive fake is nevertheless an interesting example of a 'concoction', of which the only other known instances are the Albarel map, the De Bry map of America and a variant of the Plancius world map (Shirley No. 250). These fakes are printed by lithography, which means there is no plate-mark (see the relevant headings on How to tell a fake or forgery) and the printed impression is less sharp than the original engraving. However, lithography does allow elements from various originals to be combined so as to create what is apparently a new map. Two different versions of this fake are known, dated respectively 1580 and 1595. There are two sub-variants of the latter. No online scans have yet been identified for any version, but illustrations have been supplied privately. Since the best images are of the 1595 form, that will be described first. It is, in essence, the Janssonius map of the east coast of North America from Virginia to Nova Scotia. That was undated but appeared first in the 1636 edition of the Mercator-Hondius Atlas (Burden 247). The version used as the basis for the fake is the first state, which was altered in the second state (1647) by changing the title to 'Nova Belgica et Anglia Nova' (placed within a new rectangular cartouche). At the same time an Indian village and local fauna were added. Those details were taken from Blaeu's map with the same title (actually published earlier than the Janssonius first state, in 1635 - Burden 241). None of the added elements on the fake, described below, derives from the Blaeu or Janssonius maps. Neither the 1580 nor 1595 date is remotely plausible, as was noted by earlier cataloguers. Among other anachronisms is the presence of 'Nieuw Nederland', Manbattes [Manhattan] and N. Amsterdam [New Amsterdam, later New York]. Founded in the mid-1620s, this settlement first appears in printed form on the model used by Janssonius, the 1630 de Laet map (Burden 231). The lower right quadrant, including the original scale and imprint, and Bermuda, is now covered by a large ship, flying the fleur de lys of France, with attendant sea creatures and numerous flying fish. René Tebel has identified this as an illustration, entitled 'Fliegende Fisch im Meer', found in Part IV of Theodore de Bry's Voyages (1594). This is perhaps what led the faker to date his map 1595. The sources for all but the large ship have yet to be identified, despite a check through the comprehensively illustrated Burden cartobibliography. It seems that the faker, pre-digitization, may have gathered his elements from various sources. He also thought to make it more 'beautiful' by adding new elements or inserting overlarge replacements for the sea features. The original 'Mar del Nort' lettering could not co-exist with the space required for the large ship, but there was no necessity to replace the full compass-rose with a slightly larger and more ornate example. He arranged the elements in what he no doubt considered to be an artistic way, but he clearly had no understanding of the illustrative art of the period (whether 1580, 1595 or 1636). The way that several elements are both out of scale and overlap other detail is only one of many indications of unskilled, modern work. For some reason, the only original illustration left in the sea area is a creature that has been cut into by the left edge of the border to the ship scene. If others wish to attempt to track down these illustrative elements (and all seem, separately, to be genuine), they should probably focus on De Bry for the Indian scenes. The above is a description of the framed example acquired in Cape Cod this summer by Bruce Needham. It is disfigured by overall brown staining, perhaps added by the faker for supposed authenticity. In the William C. Wonders Map Collection of the University of Alberta, Edmonton is an example, described in their catalogue as a 'facsimile' [ID/DBCN 6941/AAA-7090; Location: UA Cameron Map Cabinets; Call Number - North America C-168]. It is thought to have been acquired in the 1970s or 1980s. The Map Librarian, David L. Jones, has pointed out that the colouring of their example is different to the Needham copy and that the paper and inks are modern. Perhaps the most obvious difference is that the heart-shaped centre of the Alberta copy is coloured green, where it has been left blank on the Needham map. Intriguingly, the two 1595 examples are different in their colouring and other respects. Where the scan of the Edmonton example shows that the colouring was printed, using crude blocks of inappropriate colour (not always properly registered) the scans of the Needham example suggest that its colouring might have been done by hand, in much the same way, and with similar tones, as an original would have been treated. David Jones also points out that the '9' in the supposed date 1595 is so faint on the University of Alberta example that it looks more like 1505. Surprisingly, the sizes of the two known examples are different. Note that the sizes have been converted from inches so they should be treated as approximate; however the significant differences are clearly valid. Presumably the disparity between the versions can be explained by photo-mechanical enlargement or reduction. Library and Archives Canada, Ottawa (the Alexander E. Macdonald collection, purchased in 1981 - the original owner had noted it was a fake). It remains to be seen what prices were paid for these unconvincing 'concoctions', in an age before anonymous selling on eBay. Perhaps the decision to produce two bibliographically distinct versions (anonymous 1595 and White/de Bry 1580) was an attempt to market TWO 'rarities' to unsuspecting customers. Maphist: under the heading 'Information on Print of Janssonius Map'. Burden, Philip D., The Mapping of North America: A List of Printed Maps, 1511-1670 (Rickmansworth: Raleigh Publications, 1996), No. & Pl. 247 [the Janssonius model]. Shirley, Rodney W., The Mapping of the World: Early Printed World Maps, 1472-1700 (Holland Press, 1983, and subsequent editions, some with Corrections and Additions). At first glance a third in the sequence of distinct concoctions based on Jan Janssonius’s ‘Nova Anglia Novum Belgivm et Virginia’ (1636), this is in fact copied from Joannes de Laet’s ‘Nova Anglia, Novum Belgium et Virginia’ (1630) - Burden 231; for details see above - which Janssonius had used as his own model. The map’s size is 37.5 x 46.3 cm, without a centre-fold, on heavy, modern-looking paper, with imitation chain lines and a wide and regular fake platemark. The added elements, for example the pictures of fauna and the Indian village, were evidently taken from various sources, not necessarily cartographic ones. Only one of them has so far been identified: the scale cartouche is a reversed and slightly altered copy of that found on Blaeu’s ‘Nova Belgica et Anglia Nova’ (Burden 241). This example was acquired in 1997 at an estate sale in Brockton, Massachusetts, which, as the owner points out, is a mere 60 kilometers from Cape Cod, where it seems one of the other variants was found. In a private message, David Allen relays the view of Carl Weber (who has investigated the related Marquette map) that the Jolliet map appeared in 1880. On this see Gravier's, Etude sur une carte inconnue, la première dressée par Louis Joliet en 1674, après son exploration du Mississipi avec le P. Jacques Marquette en 1673 (Paris: Maisonneuve et Cie., 1880). The Library of Congress reproduces a facsimile from c.1900. For further material on the life and career of Jolliet, see online sources such as the Dictionary of Canadian Biography , Wikipedia, etc. 'The legend of Captain Kidd's treasure maps can be traced back to a retired Eastbourne solicitor, Hubert Palmer (d.1950) who had a private museum of Captain Kidd relics and claimed to have acquired a number of trunks once owned by the Captain, in various concealed compartments of which he had discovered charts of the locations where he had deposited his treasure. He claimed to have found certain other items, including a mirror, a Bible and a box at the same time. The claims created a certain amount of press interest. 'According to a letter written by R.A. Skelton, the Head of the Map Room at the British Museum, in 1959 recalling events of 10 years previously (no copy survives of his original letter), one of the maps was brought in for inspection either by Mr Palmer or by his housekeeper. Skelton's language was extremely guarded and he commented only that the chart had been "drawn on the back of a perfectly genuine will of the late 17th century. The chart itself contained little evidence of the precise locality represented, although . . .it appeared to be somewhere in the China Sea. While the chart contained no features which would forbid us to suppose that it was drawn in the early 18th century, it had also nothing to associate it, so far as I could see, with Captain Kidd". The maps themselves, however, are dated 1669 (a period about which nothing is known of Kidd's career) and subsequent research has revealed that the cabinets in which Palmer claimed to have found the charts dated from the mid-eighteenth century and so could have had nothing to do with the Captain. 'Skelton's readiness to commit his views to paper using the extremely cautious and non-committal language characteristic of British Museum curators of his time became accepted by later writers, who may not have seen the actual document and were working on hearsay, as 'proof' that the British Museum had authenticated the maps. 1. At some point maps, approximately modelled on the charts 'discovered' by Hubert Palmer and in an unambiguously mid-twentieth century hand were created and one of them was photographed with a British Museum photographic scale next to it, apparently giving further weight to the belief that this particular map had been 'authenticated' by R.A. Skelton and even that the British Museum (now the British Library) actually possessed the charts. 2. A few years after Palmer's death his set of charts (or possibly the copies in a 20th century hand mentioned above) were sold to a Canadian syndicate and it seems that these are still in Canada and do occasionally surface. 3. Palmer's original charts with the mirror etc. seem still to be in England, perhaps having been inherited by the housekeeper's heirs. The mirror was presented to Prince Philip in 1955 and returned by him in 2001 to the heirs of the person who made the original presentation. 4. Various people, notably Rupert Furneaux (with whom Skelton was in correspondence in the 1960s - the correspondence is preserved with his papers in Canada), have searched for the treasure in various parts of the globe. The New Dictionary of National Biography gives Kidd's birth date as c.1645 and notes that "he does not appear in the historical record until 1689". Robert C. Richie also explains: "Kidd's treasure, said to be as much as £400,000, has led to many treasure hunts from Nova Scotia to the South China Sea. Kidd never captured that much: the manifests of his victims were sent to England and their value is nothing of this order." The Wikipedia article on Kidd mentions hunts for his supposed treasure, variously in Nova Scotia, Long Island, Connecticut, Catalina Island (Dominican Republic) and the Japanese Tokara Islands. 'America siue India Nova. ad magnae Gerardi Mercatoris aui Vniversalis imitationem in compendium redacta. Per Michaelem Mercatorem Duysburgensem'. A private collector in California has alerted me to a version of the map of America included in the first edition of Gerard Mercator's posthumous Atlas in 1595. Beneath the authorship statement of Mercator's grandson, Michael, is an added 'Anno 1597', not truly centred and in a different style. Burden describes a single state of this map, always undated, found in the Mercator, then Mercator-Hondius atlas up to 1639. The scans provided show the map in its frame but it appears to be a photo-lithographic copy on modern paper, with recent hand-colouring. There is a slight, but not visually convincing, vertical fold. There is no sign of the original platemark. My informant acquired the map in the early 1980s, from the son of a Swiss bookseller who had emigrated to the USA. Intriguingly, the same added date '1597' appears on the fake/forgery of the Hondius map of America, even if the style of the addition is not identical. The two maps appeared next to one another in the Hondius atlases between 1606 and 1633 and it seems highly likely that the imitations were produced as a pair at the same time, perhaps around 1980 in Europe, even though each has surfaced only recently. Burden, Philip D., The Mapping of North America: A List of Printed Maps, 1511-1670 (Rickmansworth: Raleigh Publications, 1996) No. & Plate 87 [this fake is not recorded in the main entry, in the 'Corrigenda and Addenda' at the front of Vol . II (2007) or on the Addenda website]. A message to the MapHist list from Carl J. Weber draws attention to a range of articles on his website and to the response to his revisionism. 15 March 2012: David Buisseret and Carl Kupfer gave a presentation to the Chicago Map Society at the Newberry Library, 'The Marquette Map validated; a hoax unhoaxed.' No public copy of this is apparently available. July 2012: at least twelve 'pages' of posts on Historum - History Forums, concerned, it seems, more with plagiarism than the substantive issue. 2 August 2012: Carl Weber responded to the March talk on his < http://carljweber.com/blog/2012/08/open-letter-to-chicago-map-society-re-marquette-map-hoax-and-david-buisserets-unwillingness-to-provide-source-citations/ > Blog, with an 'Open letter to Chicago Map Society Re Marquette Map Hoax and David Buisseret’s unwillingness to provide source citations' [to which there was further follow-up]. Nebra sky disk, 1600 B.C. The 30 cm diameter Nebra sky disk "appeared as if from nowhere on the international antiquities market in 2001. Its seller claimed that it had been looted by illegal treasure hunters with a metal detector in 1999" (Wikipedia). Claims were made that it is a fake but these have been discounted. In June 2013 it was included in UNESCO's Memory of the World Register as "one of the most important archaeological finds of the 20th century". Wikipedia:'Nebra sky disk' - concluding (when seen 23 December 2007) that despite 'initial suspicions that the disk might be an archaeological forgery ... it is now widely accepted as authentic and dated to roughly 1600 BC on grounds of typological classification of the associated finds'. Ernst Künzl, Himmelsgloben und Sternkarten. Astronomie und Astrologie in Vorzeit und Altertum (Stuttgart: Konrad Theiss Verlag, 2005) [see review by Elly Dekker in Imago Mundi, 58, 1 (2006): 110]. "This week I have had through my hands a very good digital reproduction of the second state of J.B. Nolin's great wall map 'Le Globe Terrestre', 1708. It is a particularly good copy. It came complete with damaged section upper right hand margin of the map where the paper has actually been torn off the backing canvas. The map sheets were cut into 36 panels and mounted on canvas which had been treated to make it appear aged. The edging vignettes, and tables of text found below the two hemispheres in the first state are missing. This reproduction has a pencilled number in the lower lefthand margin which could identify in which collection the original is." The map described above, seen in Australia, 'was cut so close to the border that there was no room for a plate mark.' See also other messages via the MapHist archive for August 2006, under the headings 'Nolin fake' and 'Giclee sites'. The map was identified as 'a Giclee reproduction using digital technology', in other words a sophisticated form of ink-jet printing. 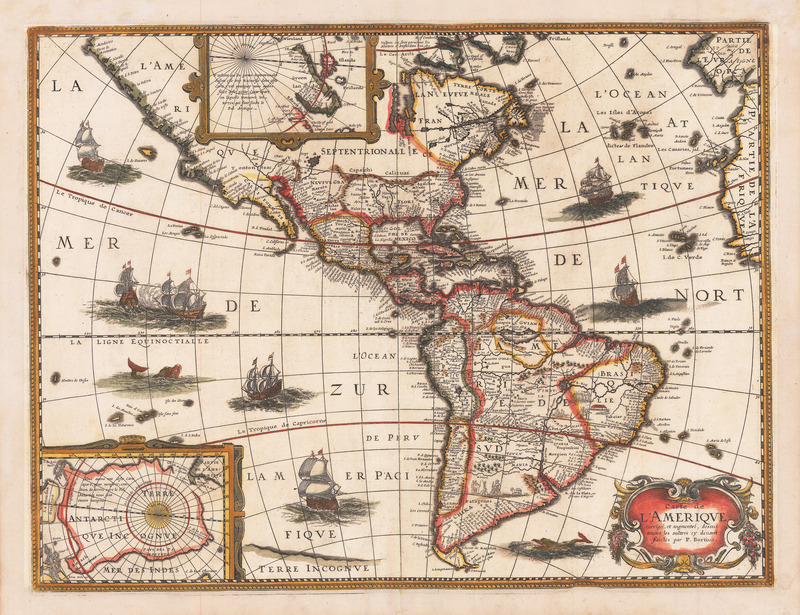 The 1708 version is state 2 of the four-sheet world map of 1700. Rodney W. Shirley, The Mapping of the World: Early Printed World Maps, 1472-1700 (Holland Press, 1983, and subsequent editions, some with Corrections and Additions), No. 605, Plate 417. It is not clear what relationship, if any, there is between the various Ortelius printed forgeries, and the actual copper-plate of America described below. While one person may be responsible for forging different Ortelius maps, it seems clear that more than one person has been involved in this activity. The Map Collector reported how the forgery was first spotted in 1980. "It was analysed and photographed using ultra-violet light which appeared to show it to have been printed from a photographically prepared plate and the paper then pressed onto a metal plate to give it a plate mark and so appear to be an engraved map. This plate mark provided the evidence of the map's forgery since the plate used was 1.25 cm wider than that used for the original. The paper used was from early church documents out of which the ink had been bleached. This ink is apparent in the photographs taken under ultra- violet light." Various other descriptions have been provided of what sounds like the same forgery or deceptive facsimile. The plate mark was much larger than usual (up to 11 mm wide). 'I pointed out that the clincher was that matter of the plate mark on the forgery not matching the bit of a black line that had been left in the original plate mark by ink that had gone over the side of the plate, and that ink then having been picked up photographically for the new image. The new, false plate mark should have been exactly where that bit of ink appeared.' (Dahl, personal communication). Another example was described as printed on what had been 'some kind of ledger paper (an old record book in some town hall? ), and the ink was bleached out but could still easily be seen'. Edward H. Dahl, 'Facsimile maps and forgeries', Archivaria, 10 (Summer 1980): 261-263. The Map Collector, 13 (1980): 39 ('Around and About'). Carl Moreland and David Bannister, Antique Maps: a collector's handbook (London & New York: Longman, 1983) p.286. With the addition of the forged date 1574, 'hachured shading effect, and colouring'. Three successive plates were used for the map of America, appearing in 1570, 1579 and 1587 respectively. None has an engraved date, see 'Index of Map Plates by Area' on Marcel P.R. van den Broecke's 'Cartographica Neerlandica' site. Marcel P.R. van den Broecke, Ortelius Atlas Maps: an Illustrated Guide (HES Publishers, 't Goy-Houten, 1996). "A fourth Ortelius America copperplate has been found. "I was recently approached by someone from Paris who said that he owned the copperplate of the third Ortelius map of the Americas , the only one without the bulge in the west coast of South America. "I went to Paris and examined and photographed a print made in an art shop from this plate, and compared it with my own copies of this map (my number Ort11). "It turned out to be extremely similar to the standard third Americas map, first state (Ort11.1), but in the longitude scale numbers along the bottom of the map, instead of the standard 260 270 280 it had 260 70 280. Whether Ort11 is a copy of this plate, or whether this plate is a copy of Ort11 is unclear, but the resemblance between this map and the standard map is so close that it is very unlikely to have been made by anyone but Ortelius. "I would be very interested to know if anyone who has access to original copies of this map can find a similar "mistake", i.e. 70 instead of 270 in the bottom longitude scale, in which case the copperplate just found was actually used in Ortelius' time. "For a picture of this map see here, which also has a more elaborate text than I can give here. When you click on the (jpg) image, you access a 23MB TIFF file of the map which allows very high magnification." [See also the follow-up message of 20 June 2005]. "About two years ago I reported a similar case on Maphist concerning Ortelius' third plate of the Americas. I was offered a copperplate (with photograph of the plate and a photograph of an offprint from that plate) to which I responded that it could not be the plate used by Ortelius, because it is known to have a second state (with Le Maire Strait on it). "Meticulous inspection of an offprint from the "new" plate proved that it was a very close copy of the plate that was used for various editions of the Theatrum from 1587 until 1641, but not identical: one place name had a full stop after the area name COGNITA in the plate that was used, but not on the copperplate that was offered to me. Also, the longitude degrees given at the bottom of the map had 260 270 280 on the plate that was used, and 260 70 280 on the plate that was offered to me. More details in Map Forum issue 7 (2005) p. 28-30. Marcel van den Broecke: "Has the Fourth Ortelius America plate ever been used?" The answer is: no. "Incidentally: this Ortelius Americas copperplate will be up for sale at Christie's Paris, May 15, 2007. Estimated price: Euro 60,000 to 80,000." With the addition of the forged date 1573, 'hachured shading effect, and colouring'. Two successive plates were used for the map of Europe, appearing in 1570 and 1584 respectively. Neither has an engraved date, see 'Index of Map Plates by Area' on Marcel P.R. van den Broecke's 'Cartographica Neerlandica' site. Marcel P.R. van den Broecke, Ortelius Atlas Maps: an Illustrated Guide (HES Publishers, 't Goy- Houten, 1996). "In April 2006 I was offered via the internet an Ortelius map of Iceland (Islandia) by someone from Visby in Sweden" (Broecke). This was identified as a forged version of the 1602 Spanish edition. The article below contains good illustrations. Marcel P.R. van den Broecke, 'Unmasking another forgery of an Ortelius atlas map: Iceland', Journal of the International Map Collectors' Society, 106 (Autumn 2006) pp. 7-9. Gróf, Lázló, 'Ortelius forgery? ', Journal of the International Map Collectors' Society, 107 (Winter 2006) pp. 32-3 [letter, touching on a number of forgery topics, responding to the above]. Marcel P.R. van den Broecke, 'Last comments on the alleged Ortelius forgery', Journal of the International Map Collectors' Society, 108 (Spring 2007): 50 [responding to Gróf's comments above]. "A few days [ago] I was approached via Email by an American who sent me a picture of a map he owns which looked very much like a copy of Ortelius' first world map, my Ort1. "No plate mark was visible on the map. Its horizontal size, measured along the top edge was 518 mm for at my request the owner put a ruler along the top and made new photographs. "A difference of about 18 mm between the map described as compared to the 5 genuine copies cannot be due to paper stretch/shrinkage. It is too large for that. "The vertical dimension of the map photographed with a ruler along the left side was 358 mm. My copies have 342, 341, 340, 340 and 340 mm. Again, the map was about 18mm too large. "When I offered to find a dealer in the vicinity of where my informant lived to check for the plate mark, he declined, and when I wrote that I would be in New York City in the first week of June, where we might meet so that I could inspect the map personally, he again declined. "For me, it is 99.9 % certain that this map is a fake, and this might be the reason why the owner did not want me to see the map. Possibly, he may offer it for sale as if it is a genuine map. This map is easy to recognize because of the inscription EDIZ.P.V. at the right side near the bottom. Beware. The world map dated 1587, as described on Marcel P.R. van den Broecke's 'Cartographica Neerlandica' site. Edward H. Dahl, ' Facsimile maps and forgeries', Archivaria 10 (Summer 1980): 261-263. Carl Moreland and David Bannister, Antique Maps: a collector's handbook (London & New York: Longman, 1983) p.286. Also online version (search for 'Reproductions'). 'Orbis Terrae Compendiosa Descriptio', in: J.H. van Linschoten Itinerario, 1596. Rodney Shirley, in a private communication, describes buying a convincing coloured facsimile about 1990. Rodney W. Shirley, The Mapping of the World: Early Printed World Maps, 1472-1700 (Holland Press, 1983, and subsequent editions, some with Corrections and Additions), No.192, Plate 157. Robert Morden, The 52 Counties of England and Wales, Geographically described in a pack of Cards [London, 1676]. 54 engraved cards, the printed surface 9.5 x 6 cm. Alleged forgeries of these were offered through 'several auction houses in England' (reported in 1983). It is thought that facsimiles produced by Harry Margary, Lympne Castle, Kent, had the word 'facsimile' erased from each card, which was then aged by 'browning'. R.A. Skelton, County Atlases of the British Isles 1579-1703 (Carta Press, 1970) p. 151. Sylvia Mann & David Kingsley, 'Playing Cards', Map Collectors' Series, No. 87 (London, 1972), plate xviii(d) [British Isles card]. The Map Collector 22 (1983): 38 [editorial note]. Rodney W. Shirley, Printed Maps of the British Isles, 1650-1750 (Map Collector Publications and British Library, 1988), p. 95 ('Morden 3'). This concerns a group identified by David Woodward (probably produced in the late 19th or early 20th century). The information below is mostly extracted from 'Could these Italian maps be fakes? ', The Map Collector, 67 (July 1994), pp. 2-10 [the map listing is on pp.6-9]. "The appearance at the end of the nineteenth and beginning of the twentieth centuries of so many hitherto unknown maps dating between 1509 and 1525, all by unknown cartographers with similar lettering styles, decorative motifs, and geographical configurations, was suspicious". "There is a remote possibility that Map 1 from the Ayer collection by Fra Bona Harigonio is genuine and that it formed a model for some of the other world maps made by clerics in Venice, supposedly in the early sixteenth century ... However, the general conclusion is that all these maps were made at the end of the nineteenth century or the beginning of the twentieth possibly for modest gain, probably more out of curiosity in the outcome." A few further general comments can be made. The maps are unusually small, are dated in most cases (unlike many proven originals), cover the world and America (with one exception - see January 2017 update note below) at a time when the latter (the focus of much scholarly and collecting interest in the relevant period) was beginning to reveal its coastlines. Most noticeable is the way that the small format was used to disguise the lack of place-names. Genuine charts, even small ones, would have had large numbers of names. It must have been highly attractive to the forger to avoid what would have been a very time-consuming task. While some early commentators were in doubt about the maps' status, Wieder and Almagià were convinced they were fakes. These maps have been appearing since at least 1907. One example was reported (privately and confidentially) in 2007 and another (see update notes) even more recently. It seems highly likely that more remain unreported. 'Maris et terrae hoc est charta marinae; Nova descriptio justa recentium observationibus.Augustinus marinalis..venetiae' [date partly erased; location now unknown - Woodward Map 13]. Although this was not made clear, Woodward Map 13 has the same unusual, two-part title as the map with Damms Antikvariat, Oslo in 1977 (Catalogue 589, No. 98, illustrated on the front cover) and they evidently refer to the same map (on which see Woodward endnote 13). [The 'Correspondence and photocopies relating to map forgeries', between David Woodward and Claes Nyegaard (proprietor of Damms Antikvariat) in 1977, is described as record # 29129 in the Newberry Library Cartographic Catalog (search for 'Nyegaard')]. 'Universalis tabula figura mundi-Venetia MDX [location now unknown - Woodward Map 2]. 270 x 190mm. Exhibited at the 6th Italian Geographical Congress (Venice, 1907). Reference: Roberto Almagià, 'Su un gruppo di mappamondi italiani del secolo XVI', La Bibliofilia, 44 (1942): 274-6. [November 2008 update]. On 30 October 2008, Diederick Wildeman reported to the MapHist list (under the heading 'Maps showing American Continent 1510'): "The Nederlands Scheepvaartmuseum in Amsterdam has a small manuscript map of the world on parchment made in Venice and dated, on the map, as 1510. Its size is 19,7 x 27,5 cm. It is our museum since the 1920's and it came in the collection from A.W. Mensing, the owner of the auction house of Frederik Muller. The map shows the American continent as one continuous land mass and India in more or less the correct form." The illustration he provided showed the Scheepvaartmuseum chart to be one of this group of fakes, exhibiting, in 'tera florida,' a typical anachronism for the year 1510. The exchange that followed (see link above) established that it was almost certainly Woodward Map 2, with the same title and date. Patrick A. Morris considered it to be in the same hand as the Newberry's 'Dolfin Bonaldo' fake ('1512'). For an enlargeable image, search the Scheepvaartmuseum's digital collection ['Search - Expert' - 'All fields' - 'Inventory number'; then enter: A.0145(252) ]. Corradino Astengo has reported a world map in the possession of a European dealer, in the style typical of this group (although each of these charts was made visually distinct). It is dated 1518 and dedicated to the Doge Leonardo Loredano (d.1521), as is the '1512 Dolfin Bonaldo' chart in the Newberry Library. The world is kidney-shaped, with a large scoop out of the top. What I have seen was an indistinct scan but there are blue-backed putti in the four spandrels, four ships, two sea creatures (one carrying a human), a compass rose in the middle of the lower margin, a vignette with a large plinth in the centre of Asia, and a garlanded feature (presumably with inscriptions and perhaps a coat of arms) in the cut-out section at the top. The chart is surrounded by a border made up of three (?) lines broken into short sections with alternating colours. The style shows that it clearly belongs to this ‘Woodward’ group (alternatively, the work of the 'Venetian Forger'). The ‘numerous coastal place-names’ cited by Bonhams obscures the fact that, as usual, the faker saved themselves a lot of work by reducing the normal complement to a mere handful. The misplacing of some toponyms, for example Antwerp and Cadiz (moved to Cape St Vincent, where it is also found on the Damms Antikvariat chart (see Woodward 2 above)), shows the usual disregard for geographical accuracy. This example is different from the others in not including America. Perhaps the increase in Scandinavian names indicates the intended market for this fake. Alternatively, this might have been created to appear pre-Columbian. Fra Hieronymo Barbolano, 1525 [Newberry Library, Edward E. Ayer Collection MS Map 7 - Woodward Map 12, fig.2]. 333 x 230mm. Entry in the Newberry Library Cartographic Catalog. Reference: Gregory C. McIntosh, 'More about fake maps', The Map Collector, 69 (1994): 52. Fra Michiel Barbolan, 1514 [location now unknown - Woodward Map 7, fig.4]. References: Geographical Journal 1908; Roberto Almagià, 'Su un gruppo di mappamondi italiani del secolo XVI', La Bibliofilia, 44 (1942): 274. Dolfin Bonaldo, 1512 [Newberry Library, Edward E. Ayer Collection MS Map 9 - Woodward Map 5, fig.1]. 334 x 232mm. Entry in the Newberry Library Cartographic Catalog. The date had originally been read as 1541 [MdXLI] but it is assumed to be 1512 [MdXII], which fits the period of the cited doge, Leonardo Loredano (d.1521) [assuming, of course, the faker had the appropriate knowledge - additional information, September 2008, from Robert W. Karrow]. Reference: Gregory C. McIntosh, 'More about fake maps', The Map Collector , 69 (1994): 52. Dolfin Bonaldo, 1519 [Christies 13 December 1984 Lot 124 (withdrawn) - Woodward Map 10, fig.3]. 475 x 475mm. References: Josef Fischer, 'Eine bisher unbekannte venezianische Weltkarte aus dem Jahre 1519', Petermanns Geographische Mitteilungen 87 (1941): 449-51, plates 70-71; Michael Layland, 'Geographical clues to suspect maps', The Map Collector, 69 (1994): 52. Baldo Brunacius, 1516 [Newberry Library, Edward E. Ayer Collection MS Map 6 - Woodward Map 8, fig.9]. 328 x 225mm. Entry in the Newberry Library Cartographic Catalog. Matheo de Chiara de Arimino, 1519 [4-chart atlas, Huntington Library, HM 217 - Woodward Map 11, figs 5 & 6]. Chart sizes: 229 x 307mm. 'First chart bears inscription "me fecit fra Matheo de Chiara de arimino anno domine [sic] mdxix," however the atlas is of questionable authenticity and appears to have been made by the same cartographer as HM 218 (q.v.). It cannot be of the date inscribed since the west coast of North America and entire northwestern section of South America could not have been known until much later. The handwriting appears to be of nineteenth or early twentieth century origin. Parchment seems old; there are worm holes, but none that penetrate from one surface to the next, making it appear that the holes were present before the atlas was assembled; blank back sides are heavily scratched. No owners’ markings. Purchased by Henry E. Huntington in 1925 from Weymer Mills, London, who stated in a letter preserved in Library files that the manuscripts (i.e., HM 217 and HM 218) "have been in the possession of an English family for 500 years"'. High resolution scans can be seen here. References: Michael Layland, 'Geographical clues to suspect maps', and Gregory C. McIntosh, 'More about fake maps' - letters in the The Map Collector, 69 (1994): 52. Matheo da Gaio, 1516 [Huntington Library, HM 218 - Woodward Map 9, figs 7 & 8]. 371 x 483mm. From the Huntington Library description: 'Chart is of doubtful authenticity and appears to have been made by the same cartographer as HM 217 (q.v.). It cannot be of the date inscribed since it bears the place names "Nova Francia" and "Canada" that were not used until Cartier’s explorations in 1534-37. The script seems modern and the artistry of the wind-heads appears to be late nineteenth century. Purchased by Henry E. Huntington with HM 217 (q.v.) from Weymer Mills, London, in 1925'. Fra Bono Harigonio, 1509 [Newberry Library, Edward E. Ayer Collection MS Map 5 - Woodward Map 1, fig. 10]. 340 x 230mm. Entry in the Newberry Library Cartographic Catalog. Fra Bono Harigonio, 1511 [location now unknown (formerly Prof. Erland Nordenskiöld Collection) - Woodward Map 3]. Hieronimi Marin, 1512 [Library of the Foreign Ministry of Brazil - Woodward Map 4]. 380 x 302mm. Facsimile produced by Danesi in Rome before 1921; exhibited at the Brazilian pavilion at the New York World's Fair in 1940/41. "Ptolemy world map, Ulm, ca. 1482. Paper on forgery is more limp. Dimensions are a bit smaller. Forgery has scroll down instead of up." [I recall (in the 1990s?) seeing a map from the Ulm Ptolemy (I think the World) which was particularly interesting because it reproduced a blemish found only in the Theatrum Orbis Terrarum facsimile edition (1963), i.e. the forger had photographed that rather than an original. Unfortunately, I did not keep a detailed note - Tony Campbell]. A map of Roman Britain, supposedly produced by 'Richard of Cirencester' in 1338, drawn and engraved by Charles Bertram in 1755 and published in Denmark in 1757. The antiquarian, William Stukeley believed the map to be genuine and arranged for his own version to be printed by the Society of Antiquaries, also in 1757. Rodney W. Shirley, 'The map that never was', The Map Collector, 53 (1990): 8-13 (reproducing both versions). Rodney W. Shirley, Printed maps of the British Isles, 1650-1750 (Map Collector Publications & the British Library, 1988), p.133. Mark Jones (ed. ), Fake? The Art of Deception (British Museum, 1990), p.66 (reproducing the Stukeley version). In November 2014, the appearance of Benjamin B. Olshin's, The Mysteries of the Marco Polo Maps provides a thoroughly researched, forensic, and commendably neutral, analysis of a group of maps (now eight, originally ten) along with four related texts, associated with the three daughters of Marco Polo. The best known of the cartographic documents is a small map of Northeast Asia (known as the 'Map with Ship'), now in the Library of Congress. The documents, which include some largely incomprehensible Chinese along with Arabic toponyms, are clearly of different dates but some might be copies of maps produced in the early 14th century documenting a Chinese foray (by Marco Polo?) across the Bering Strait to Alaska. Olshin plays Devil's advocate, assumes nothing, and makes no attempt to hide the difficulties and inconsistencies in the material. However, he fails to find any motivation for or evidence of modern forgery. Indeed his identification of many of the people referred to, members of patrician North Italian families over several centuries, corroborates the gradual, piecemeal accumulation of that material. What it all means remains elusive. This is essential reading. Benjamin B. Olshin, The Mysteries of the Marco Polo Maps (University of Chicago Press, November 2014). Did Marco Polo "Discover" America? Maps attributed to the 13th-century traveler sketch what looks like the coast of Alaska (a piece by Ariel Sabar for the Smithsonian Magazine, October 2014). This is a trailer for the Olshin book above. John W. Hessler, 'Sketching the Unknown: A Phenomenological and Computational Study of the Rossi "Map With Ship"' (on his blog, Warping History: Mathematical Methods in Historical Cartometry, 31 December 2008 - 'A recent C-14 dating of the vellum yielded two age distributions both after 1475 ... In conclusion we have shown that the Rossi "Map With Ship" has no internal or geometric inconsistencies that would lead us to believe that it was definitively copied from a modern map'). The question of the nature of the projection on the 'Map with a Ship', if there was one, led to a flurry of messages in January 2009 on MapHist - look for 'Rossi', 'Projections' and 'Projectionless' - though much of this was polemical and not about the map in question. John W. Hessler, messages to the MapHist list, both with heading 'Cartographic Fakes, Tony Campbell, etc. ', on 31 January 2008 and 4 February 2008 [about progress with the scientific testing of the maps, to throw light on their date(s) and to retrieve unreadable sections]. Gunnar Thompson, one from a series of messages to the MapHist list from January 2008 onwards, in this case on 4 February 2008, discussing, under the section 'Dating the Map With Ship', his earlier efforts to obtain a radiocarbon dating. [To get round the lack of word-wrapping, paste the text into another document.] On 25 September 2011 Gunnar Thompson returned to the issue, asserting the authenticity of this group of maps, in a message: 'Marco Polo New World Maps--Authentic'. See also two follow-up messages under the heading: 'Brief Comment Concerning: [MapHist] Marco Polo New World Maps--Authentic'. Benjamin B. Olshin, message to MapHist on 24 April 2006, 'Gavin Menzies / Gunnar Thompson / "Map with Ship"'. Leo Bagrow, 'Maps from the Home Archives of the Descendants of a Friend of Marco Polo', Imago Mundi, 5 (1948), pp. 3-13 (reproducing the five maps on a fold-out page preceding the article). [Comment from Bagrow about that article in editorial (p.2) in that same issue that 'he has received conservative opinions from many experts'.] Private subscribers to Imago Mundi, and those with institutional access, can get that article via JSTOR. Library of Congress, 'American Memory': [Map of the Far East and adjacent Pacific] (also known as 'Map-with-ship'). [A brief description accompanying a JPEG2000 scan enlargeable to high resolution - added 22 February 2008]. John Foster, 'A map of New England' in William Hubbard, A narrative of the troubles with Indians in New-England (Boston, 1677) [apparently the earlier Boston version, rather than the London printing]. Woodcut. McCorkle 677.2, Burden 2: 484. There is some doubt as to what were or were not facsimiles among the maps associated with Smiley. It seems that the only person to have examined the three maps above was William Reese, Yale University's evaluator. Finnegan discusses this issue (p.70), quoting Reese as saying: "They did lots of great reproductions in the nineteenth century, not usually with intent to deceive, and they often used older paper". It seems that these facsimiles were good enough to confuse Reese for a time. The Rouillard/Le Clercq facsimile is not otherwise recorded. Given Finnegan's suggestion that Smiley might have been intending to substitute facsimile versions for original maps bound into books, it is regrettable that the exact nature and origin of those 'facsimiles' was not publicly resolved. Philip Burden, The Mapping of North America II: a List of Printed Maps 1671-1700 (Rickmansworth: Raleigh Publications, 2007). William Finnegan, 'Annals of crime: a theft in the library. The case of the missing maps', The New Yorker, 17 October 2005, pp.64-79. Barbara McCorkle, New England in Early Printed Maps, 1513 to 1800: An Illustrated Carto-Bibliography (Providence: The John Carter Brown Library, 2001). Rodney W. Shirley, The Mapping of the World: Early Printed World Maps, 1472-1700 (Holland Press, 1983, and subsequent editions, some with Corrections and Additions). Soleto Map, 5th century B.C. What has been claimed as 'the world's oldest map' has been branded a fake (see below). It appears that the matter has not yet been resolved. ‘A New Ancient Map? The Salentine peninsula in the 5th century BC’. "The object discovered on the 21st of August 2003 at Soleto (province of Lecce, Italy), in the course of on-going archaeological excavations directed on behalf of CERCAM (Université Paul Valéry) by Th. Van Compernolle, is an ostrakon, i.e., a fragment of a vase, in this case, an attic black-glazed vase, on which is incised the coastline of the Salentine peninsula as well as thirteen toponyms whose positions are indicated by points. The "Soleto Map" is, to date, the most ancient geographic map of classical antiquity to have been discovered." (Ancient World Mapping Center). Thierry Van Compernolle. 'La "Mappa di Soleto". Document de travail provisoire préliminaire au Colloque de Montpellier, 10-12 mars 2005' Colloque International "La Mappa di Soleto". Échanges de cultures en méditerranée ancienne, Montpellier 10-12 mars 2005. < http://news.telegraph.co.uk/news/main.jhtml?xml=/news/2005/11/18/wmap18.xml> 'Archaeologists find western world's oldest map' (by Hilary Clarke in the Daily Telegraph (London) - about the 'Soleto map' of the Salentine peninsula at the extreme south of Italy, discovered in 2003, claimed here to be "the oldest map of anywhere in the western world, dating from about 500 BC. 'World's oldest map' a fake? (Soleto map 5th century BC) - message to MapHist from Peter van der Krogt, who summarises the claim by a Dutch archaeologist that the map is a fake - see Douwe Yntema, 'Ontdekking "oudste kaart" een grap? ', Geschiedenis Magazine, 41, 1 (Jan-Feb 2006), p.5. The Map Room: a Weblog about Maps - see the Hoaxes & Controversies Archives. Rodney Shirley's account of this map mentions the existence of a "modern reproduction ... in which the right-hand cartouche has the sub-title Carte De l'Europe Et D'Asie aussi L'Afrique and the left-hand cartouche has added to it at the bottom the date 1643". "Pierluigi Portinaro and Franco Knirsch, The Cartography of North America, 1500-1800 (New York: Crescent Books, 1987), 166-67, reproduce what they say is Melchior Tavernier's double-hemisphere world map (Paris, 1643), but is in fact a 'concoction.' The two hemispheres, with their geographical content, are indeed derived from Tavernier's map but the spandrels are filled with vignettes taken from Blaeu's Light of Navigation and other Dutch sources. Moreover, the vignettes are clearly drawn and colored with modern brushes; one is signed by the artist. It is on modern paper. From the nature of the printed color and the style, I would place this as a product of the postwar era, perhaps as late as 1970. I encountered this when it was shown me by a friend of a friend who had acquired it a long time ago in Paris (I think). This person was convinced it was authentic, because it had been reproduced in the book as a genuine seventeenth-century work." For other examples of modern 'concoctions' see How to tell a fake or forgery - Defnitions. Rodney W. Shirley, The Mapping of the World: Early Printed World Maps, 1472-1700 (Holland Press, 1983, and subsequent editions, some with Corrections and Additions), No.360, Plate 274. A manuscript map of the northeastern United States and southeastern Canada, drawn about 1610 and supposedly sent by the Spanish ambassador in London to Philip II. It was 'discovered' in the Archivo General de Simancas in 1887 and has featured prominently in histories of cartography since. "This article raises the possibility that the map may actually be a nineteenth-century forgery. The map is based primarily on information found on early seventeenth-century maps, most of which were not published in 1610, although it is possible that manuscript copies of these maps might have been available as early as 1610. The overall geographic framework of the map seems to be improbably accurate for its supposed date of creation. The map contains numerous oddities, and many features on the map do not appear on other maps made in the early seventeenth century. Overall it seems anachronistic and it stands in isolation from other maps made around 1600. Although no single feature on the map proves beyond a doubt that it is a forgery, the overall weight of the evidence makes it seem highly probable that it is a fake. Tests on the paper, pigment, and handwriting of the map should be made to prove conclusively whether or not it is a forgery." David Y. Allen, 'The So-Called "Velasco Map": A Case of Forgery? ', Coordinates: Online Journal of the Map and Geography Round Table, American Library Association, ser. A, no.5 (February 14, 2006). Kirsten A. Seaver, "Commentary to 'The So-Called Velasco Map: A Case of Forgery? '", Coordinates: Online Journal of the Map and Geography Round Table, American Library Association, ser. B, no.5 (February 14, 2006). Deborah Taylor-Pearce, 'Map of Atlantic Coast of North America, 1610 (also known as the "Velasco Map")' [text and comparative illustrations]. Deborah Taylor-Pearce, 'Color and/or modern reproductions of the "Velasco Map" - I' [the first of five gallery pages]. 'The Genesis of the United States - Alexander Brown 1890' (excerpts, and illustrations, from the book by the map's discoverer, and from Fite & Freeman's A Book of Old Maps Delineating American History (1928)). Undoubtedly the most contentious map in the modern history of the subject. The literature on it is vast, stretching back to the first publication of R.A. Skelton (et al.) The Vinland Map and the Tartar Relation (Yale University Press, 1965). The map has been attacked as a fake from numerous directions, and defended robustly from some of them. Majority opinion supports the fake thesis, but it still has a handful of supporters. If it is to be confirmed a 20th century fake, we await a full-scale demolition and a universally accepted narrative of where, when and by whom it was created. Kirsten A. Seaver, Maps, Myths, and Men: The Story of the Vinland Map (Stanford University Press, 2004) [the most thorough examination of the 'fake' case, and identifying the man responsible as Father Josef Fischer]. James Robert Enterline, Erikson, Eskimos, and Columbus: Medieval European Knowledge of America (Baltimore: Johns Hopkins University Press, 2002) [by a staunch defender of the Vinland Map]. P.D.A. Harvey, 'The Vinland Map, R. A. Skelton and Josef Fischer', Imago Mundi, 58:1 (2006): 95-9 - freely accessible via Taylor & Francis/Informa [a review article about Seaver's book: 'During the past forty years I have often heard it said that the Vinland Map is, of course, an obvious forgery. It is nothing of the kind. If it is a forgery - and I think it most likely is - it is an extremely skilful one...']. For online links into the continuing discussion see 'Web articles and commentaries on specific topics in the History of Cartography. 4. Themes' [under 'Vinland Map']. Interestingly, the provenance was from the estate of Arthur Bruno Drescher, a German-British paper restorer. The forgery was unmasked for three main reasons: the print was laid on top of glue speckling (as revealed in 60x magnification), the image had more details than other examples (where a woodcut will normally lose elements through wear, because the printing surface is raised and thus vulnerable), and - the clincher - a white line in the Christie’s map “matched a spot in an authentic print of the map now held at the James Ford Bell Library at the University of Minnesota in Minneapolis, where extra paper had apparently been added to repair a tear.” The repetition of a copy-specific feature is automatic and incontrovertible proof of photographic reproduction. “Two other copies believed to be authentic have emerged, one from a monastic library in Offenburg, Germany, in 1993 and another discovered in a European collection and sold by Christie’s in 2005 for $1 million,” to a private buyer. However, the example in the Bavarian State Library (Bayerische Staatsbibliothek, Munich) appears to be identical to that submitted to Christie’s recently. In all, then, there are five known examples of a loose woodcut map produced in or around 1507, of which two (Christie’s 2017 and Munich) seem to be reproductions of a third (James Ford Bell). Those copies have not been noted before 1960. They should be considered as forgeries designed to deceive rather than innocent facsimiles, because of the care taken to disguise the modern printing. That so many knowledgeable people were deceived is worrying but Barry Ruderman adds an optimistic coda: “It proves that in modern times, a collector or dealer, with just the technology on their desktops, can identify a forgery that consistently fooled auction houses and experts in the past”. It will be interesting to learn the results of any detailed examination of the supposed Munich imitation, as well as the two other, evidently original, impressions (Offenburg and Christie’s 2005). If the latter are proved genuine and identical to that in the James Ford Bell, it may well be possible to place them in a printing sequence on the basis of small amounts of damage suffered. Even if the globe gores were first published in 1507, it is quite possible that some examples would actually have been printed later. Michael Blanding, ‘Why Experts Don’t Believe This Is a Rare First Map of America’, New York Times 10 December 2017, from which the quotations above are taken. Corey Levitan, 'The Map Man of La Jolla', La Jolla Light, 9 January 2017 [about Alex Clausen of Barry Lawrence Ruderman Antique Maps, who unmasked this forgery; the article confirms that the gores in the Bayerische Staatsbibliothek, Munich represent the second example of that]. Rodney W. Shirley, The Mapping of the World: Early Printed World Maps, 1472-1700 (Holland Press, 1983, and subsequent editions, some with Corrections and Additions), No.27. The map was published in Venice in 1558 with the title 'Carta da navegar de Nicolo et Antonio Zeni furono in tramontana lano MCCCLXXX' . It had supposedly been edited by their descendant Nicolò Zeno. Later sixteenth-century mapmakers followed its outlines and Hobbs likewise accepted that the published map faithfully reproduced a fourteenth- century manuscript. Others have disagreed, claiming it was a fake. O.A.W. Dilke, in Volume 1 of The History of Cartography, p.197, n.97, states that 'the Zeno map is now thought to date not from 1380, as Nicolò Zeno the younger claimed, but from much later.' The most recent opinion takes a middle position: that it was largely a fabrication but containing some genuine information. Catherine Hofmann, 'La carte des frères Zeno (1558), une imposture cartographique? ', in: Jean-Marc Besse & Gilles A. Tiberghien (eds) Opérations cartographiques: dimensions, corps, matérialités, rencontres, imaginaires (Arles: Actes sud; ENSP, 2017), pp.304-7. Elizabeth Horodowich, 'Venetians in America: Nicolò Zen and the Virtual Exploration of the New World', Renaissance Quarterly 67 (2014): 841-77. William Herbert Hobbs, 'Zeno and the cartography of Greenland', Imago Mundi, 6 (1949), pp. 15-19. Terrae Incognitae, vol. 2 pp.75-86; vol. 9 pp.81-3.